ARLINGTON, VA; March 19, 2013 -- PBS and WGBH announced record-breaking national household ratings for “Downton Abbey, Season 3” on MASTERPIECE CLASSIC. Nielsen Live +7 household data for the drama, a Carnival/MASTERPIECE co-production, shows a 7.7 season average rating and an average season audience of 11.5 million viewers who tuned in via their local PBS station. These numbers outperform “Downton Abbey, Season 2” by 64 and 65 percent, respectively. The Season 3 finale on February 17, 2013, which earned an 8.1 national rating and an average audience of 12.3 million viewers, was the #1 rated show of the night, beating all broadcast and cable competition in prime time. In total, 24 million viewers tuned into “Downton Abbey, Season 3” over its seven-week run — a 7 million-viewer increase from Season 2 — making it the highest-rated PBS drama of all time. 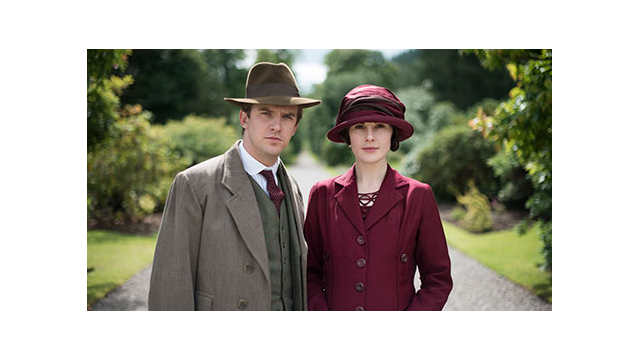 “We are so pleased with the loyalty and support US audiences have shown ‘Downton Abbey’ throughout this season,” said MASTERPIECE executive producer Rebecca Eaton. “We look forward to more great drama and new challenges for the Crawley family in Season 4.” MASTERPIECE's next highly anticipated series is "Mr. Selfridge" starring Jeremy Piven, which premieres Sunday, March 31 at 9:00 p.m. ET, following the second season premiere of CALL THE MIDWIFE at 8:00 p.m. ET. Overall social media activity around “Downton Abbey, Season 3,” as measured by SocialGuide Intelligence, said that “Downton Abbey” was the “#2 most social TV series” on the January 6 premiere and February 17 finale, generating nearly 100,000 and 80,000 comments of all kinds across the Internet, respectively. Specifically, the #DowntonPBS hashtag averaged 46,000 mentions per Sunday night broadcast and 5,500 daily mentions during the week between broadcasts — the highest Twitter buzz ever for PBS. Unique broadcast check-ins on GetGlue totaled more than 66,000 over the series run, generating nearly 25 million impressions. The season has remained the #1 best-seller since September 2012 on shoppbs.org, as well as the #1 show on both iTunes and Amazon Instant Video since the January 7 launch. Seasons 1 & 2 continue to rank as the most watched TV seasons on Amazon Prime Instant Video. “Downton Abbey” is a Carnival/MASTERPIECE Co-Production. Carnival is a division of NBCUniversal. MASTERPIECE is presented on PBS by WGBH Boston. Rebecca Eaton is Executive Producer for MASTERPIECE. Funding for the series is provided by Viking River Cruises and Ralph Lauren Corporation with additional support from public television viewers and contributors to The MASTERPIECE Trust, created to help ensure the series’ future.